If you play your cards correctly but still lose a hand, you're “resulting” when you focus on the outcome instead of the quality of your decisions. You cannot control outcomes; you can only control your actions. Note: As long-time readers know, I grew up Mormon. One of the songs we were taught as children has this terrific lyric: “Do what is right, let the consequence follow.” This has become something of a mantra for me as an adult. If I do the right thing — whatever that might be in a given context — then I cannot feel guilty if I get a poor result. It's my job to do my best. Beyond that, I cannot control what happens. Duke contrasts poker (and life) with chess. Chess is a game of complete information, a game of pure skill. There's no luck involved. At all times, all of the pieces are available for both players to see. There are no dice rolls, nothing to randomize the game. As a result, the better player almost always wins. (When the better player doesn't win, it's because of easily identifiable mistakes.) Because chess is a game of complete information, luck isn't a factor — the outcome is only a matter of the quality of your decisions. It's because our decisions are made with incomplete information that life sometimes seems so difficult. You can do the right thing and still get poor results. You can opt not to drink on New Year's Eve, for instance, but still get blindsided by somebody who did to drink and drive. You made a quality decision, but happenstance hit you upside the head anyhow. Vizzini pours two goblets of wine, then Roberts (actually our hero, Westley, in disguise) poisons one of them with deadly “ioacane powder”. The challenge is for Vizzini to choose the non-poisoned goblet. Vizzini cackles with glee when Roberts/Westley downs the poison — but then falls dead after drinking his own goblet. It turns out both goblets had been poisoned, but Roberts had spent the previous few years building an immunity to iocane powder. Vizzini made a quality decision based on the information he had, but he didn't have all of the information: both goblets were poisoned, and his opponent in this “battle of wits” was immune to the poison in the first place! Duke argues that in order to make smarter decisions, we have to embrace both the idea that there's a lot of luck in life and the reality that we're swimming in uncertainty. There's a stigma in our culture about appearing ignorant, about being unsure. Duke says that becoming comfortable with uncertainty and not knowing is a vital step to becoming a better decision-maker. “Admitting that we don't know has an undeservedly bad reputation,” she writes. We should be pursuing “high-quality ignorance”. Based on all of this, how then can we make smarter decisions? Duke says that we should stop thinking in terms of right and wrong. Few things are ever 0% or 100% likely to occur. Few people are ever 0% or 100% right about what they know or believe. Instead, we should think in bets. Just as each poker bet carries a different chance of success (based on the quality of the hand, the hands of the other players, etc. ), so too the bets we make in life carry different chances of success. And our personal beliefs have (or should have) varying degrees of certainty. 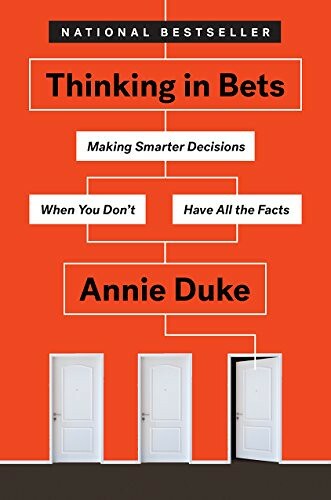 Duke wants readers to begin thinking about their beliefs and decisions in terms of probabilities rather than in terms of black and white. Turns out I already do this to a small degree — but usually for minor stuff. In fact, I've done it several times in the past week. Because it's been hot in Portland lately, folks in my neighborhood have all been taking early morning walks. We all tend to follow the same two-mile loop because it's easy. I've started playing a game when I pass somebody. “Okay, the dog and I passed David Hedges at the llama farm. Where will we encounter him on the top side of the loop? I'll be it's between Roy's house and the bottom of the hill.” It's fun for me to see how accurate my guesses are. Duke believes that we should each do this sort of thing whenever we make a decision. Before we commit to a course of action, we should think about possible outcomes and how likely each of those outcomes is to occur. Let's say you've only got $200 in the bank and it's a week from payday. Should you join your friends for that weekend motorcycle trip? Or should you save that cash in case something goes wrong? Or, thinking farther in the future, what outcomes are you seeking in life? What decision will improve the odds of achieving those outcomes? Or, imagine that you're trying to decide whether or not to buy a home. As you consider the possibilities, think about the probability that each possible future will occur. Don't simply cling to the outcome you're hoping for. Be objective. If the odds of success seem reasonable, then pursue your desired course of action. But if they don't, then pull the plug. Every choice carries an opportunity cost. When you choose to save for the future, for instance, you're giving up pleasure in the present. 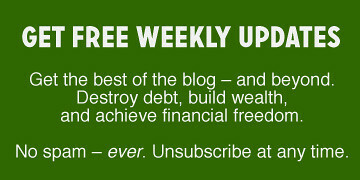 Or, if you choose to spend in the present, you're giving up future financial freedom. For a long time, I've argued that the best books about money are often not about money at all. Thinking in Bets is another example of this. While Duke uses plenty of personal finance examples, the book itself is about self-improvement. It's not a money manual. Yet the info here could have a profound impact on your financial future. There's a lot more in this book that I haven't covered in my review. (I've really only touched on the first third of the material!) For me, the biggest takeaway comes early: It's vital to separate decision quality from results. The rest of the book explores how to improve the quality of your decisions. Learn to examine your own beliefs. Be your own devil's advocate. If you're certain about something, explore the opposing viewpoint. (If you're liberal, seek conservative opinions. If you're conservative, look for liberal voices.) Be skeptical — of yourself and others. When you make decisions, think of the future. Use barriers and pre-commitment to do the right thing automatically. Practice backcasting, a visualization method in which you define a desired outcome then figure out how you might get there. The book is dense — dense! — with ideas and information. When I finished it, I wanted to go back and read it again. Plus, I wanted to plow through the nearly 200 other works that Duke lists in her bibliography. I feel like I could spend an entire year diving deeper into this book and its related reading. But, as much as I wish it were, Thinking in Bets isn't perfect. A strong argument could be made that this material would work better as a TED talk or a 5000-word essay in The Atlantic (or on Get Rich Slowly!). The book is so packed with info that it sometimes loses its way. There's also a lot of repetition — too much repetition. Plus, it seems to lack a clear sense of organization. These quibbles aside, Thinking in Bets has earned a permanent place on my bookshelf. If I ever get around to putting together a Get Rich Slowly library (a project I've been planning for years! ), this book will be in it. I got a lot out of it. And I bet you will too. There are 27 reader responses to "Thinking in bets: How to make smarter decisions". This comment is a sort of statistical record-keeping for myself. This review ended up at 2481 words and took exactly three hours to write and edit. It took me two days (and roughly six hours) to read the book. So, total time invested in this post is nine hours. On a scale of 1 to 10, the difficulty of writing this piece was a 2. Well, it was time well spent! I really enjoyed this review, which I’ll admit, I didn’t expect to as soon as the word “poker” came up. I hate card games. But you’re right, the ideas in this book were fascinating. Chess, for instance. I haven’t played chess for YEARS, yet she’s absolutely right when she says that all the information is there. It makes me want to go and join the chess club at work and start honing my skills again. I’m used to thinking about life in terms of the random effects of luck – I don’t call myself ‘Fortunate Frogdancer’ on the blog for nothing as I’ve always been a very lucky person – but I’ve never thought about evaluating decisions in terms of percentages of success. That’s a very useful and objective tool to add to the toolbox. I’m sending the link to this post to my sons. I’m hoping they’ll find some value in these ideas too. Great question, John. I think the reason I like Sapiens so much is that it takes info from a wide range of fields and brings it together in a sort of unified whole. My background is in psychology, but I don’t know much about biology or anthropology. I feel like the author does a good job — although, again, I don’t have a lot of background here — at explaining why people are they way they are, how are present-day psychological make-up is derived from our animal origins. (If you don’t believe we have animal origins, you’re not going to find his arguments persuasive.) I love some of his ideas, like the argument that humans didn’t domesticate wheat — wheat domesticated us. That’s kind of mind-blowing. I don’t know. I love wide-ranging books like this, books that tackle big themes, mixing history and anthropology and psychology. They’re fun! Agreed. Most important book I’ve read in a long time, a very long time. Yuval Harari put one of the “biggest” books ever together on that one. Your wheat example is one of many in the book. I was blown away by the short conclusion chapter which ends and ties the book’s themes together so brilliantly. If you read nothing else, it could stun a reader. I was literally shaken by the clarity of the messaging about what path Sapiens are on and what we are likely to do next if we survive. The most mind expanding class I took in college was Human Evolution. It was co-taught by a biologist and an anthropologist. Religion teaches us that we are all brothers and sisters under God but that class made me see the whole journey mankind is on and really made me feel connected with all people and how we need to work together for our future. Thank you for the book recommendations. Actually, you made a bad decision. You decided to go out on New Year’s Eve when there are drunk drivers all over the place. Which is what makes the distinction between good decisions and good outcomes not very useful in real life. Not only do you lack all the information, you also lack the ability to evaluate the odds. Your decisions are often neither good nor bad, they are random. To the extent we do understand the odds, it is by our experience with outcomes. So the belief that you made a “good” decision with a bad result or a bad decision with a good result is self-defeating. The result is the necessary feedback to making good decisions. Of course “good” in terms of reflecting your values, whether religious or otherwise, is a different story. There are plenty of people who think poker or any other form of gambling is a bad decision by definition. Ross, you’re being nitpicky. I could have just as easily said, “You can opt not to drink and drive after work, but still get blindsided by somebody who DID drink and drive.” You’re fixating on a small detail that’s irrelevant to the point, and I think you know that. I think you’re also aware that while yes, some of our choices are random, others ARE better or worse than others. We might not be able to see it, but others can. Think of how many times you watch friends or family make poor decisions that are clearly poor decisions. Think about how many times you yourself probably make poor decisions but are unaware of it. The book sounds interesting. I’ll put it on my reading list. I think we already do this to a certain degree. Most of our decisions are based on experience. I try to make good decisions, but I know the results might not work out well all the time. It’d be great to be able to think in term of percentage, though. Life is more complicated than poker. What a fantastic review. This puts into language much that I have thought about life. There is only so much we can do about our lives, but we still have to do it. In fact, I would go so far as to say, you summed it up so well I don’t think I need to purchase the book. Thanks for this. Excellent topic on decision-making and outcomes, J.D. Yes, luck is the thing that is out of our control. This study was a mind-blower to me, showing that having the attitude of “being lucky” or “being unlucky” directly affected the quality of decisions the businesses made. As this article details, a business’s positive or negative belief made a quantifiable difference in how companies dealt with setbacks or opportunities. You can’t control luck, but you can choose to believe and re-affirm that you are lucky (or unlucky). That belief can give you an edge by improving decision-making, so that you are more likely to overcome setbacks and leap on opportunities. For me, this discovery was about as magical and beneficial as compound-interest! I recommend this article to all my students. The Knowledge Project, a great podcast done by Shane Parrish and the people at Farnam Street, released a podcast episode with Annie Duke just yesterday. For whatever reason, the link to this episode isn’t yet available on their website but it is available on both of my podcasts apps. I also grew up Mormon. Great, thought-provoking read. We just sold our Seattle home and we’re moving down to Portland later this month. We’ve made the decision to set aside our windfall from the sale and rent for awhile, with the thought that the market will cool and we’ll be able to get a deal. At this point, we’re definitely “clinging” to this desired outcome rather than looking at the objective possibility that house prices will continue to rise. We need to make some contingency plans in the real possibility that housing prices continue to rise. As an amateur poker player, thinking in bets (the concept, not the book) has very much impacted my life. Every decision we make has a potential benefit, risk and opportunity cost. Carefully considering these things helps us make better decisions. I’m a strong believer that a true understanding of poker can help one apply solid personal finance principals. Thanks for reviewing this book. I enjoyed your view. Well written article! Thanks for a good read! One part that many people probably can resonate with – being uncertain doesn’t have to be bad! Although it looks like someone else might know what they are doing, they could have spent the last 5 hours trying to figure out which direction to go. Many people experience the same feeling of uncertainty when it comes to credit cards, finance, homebuying etc. My suggestion is: use the resources already in place to get knowledgable. I don’t know if it is my place to say this but you deserve every single penny you have earned from blogging. The effort you put in, the research you do and most important of all, your writing is simply great. I have learned so much and gained so many new insights reading your articles over the years. Thank you for everything. P.S. We had some beers in Antalya a few years back !! And, another two books were just requested from the library. :) Thanks! I think the hardest part of making certain bets is going against conventional wisdom and dealing with the feedback and concern, because we don’t share all the details of our unconventional choices and circumstances. Our odds are good, but it sure doesn’t look like it from the outside! I like the logic behind this “thinking in bets” strategy. I’m going to check out this book! Thanks for the share! For thirty-five years or more I’ve thought of life as something like playing a game of Zaxxon with a joystick where we control left or right (side-to-side on the joystick) completely, but up or down (away from us and towards us on the joystick) is pretty much random. Consequently, I try to steer sideways to whichever point offers the least possibility of damage, and the best possibility of reward, should I suddenly rise or dive. But sometimes these possibilities are not mutually exclusive and that can make for some tough tradeoffs. Poker taught me that the game…and life…(and investing!) is more affected in the short term by luck, but in the long term by decisions. The best poker player can lose in the short term to a rookie, but in the long term they’ll win. You can have undeserved poor or great outcomes in life in the short term, but in the long term (way more often than not) life isn’t based much on luck and instead on decisions. Granted, catastrophically bad luck happens on occasion (something like cancer, not something like an absent father) but it’s our decisions that ultimately get us to where we are. I’m of the opinion that the more viewpoints you have (from advisors, opposing viewpoints, casting of possible futures — as you suggest in the end), the HARDER it is to make the decision. Almost akin to the paradox of choice or analysis paralysis. More information IS better — but only up to a certain extent. In other words, I become more unsure when there are more things to consider because it reveals additional potential outcomes. Other than that, interesting article! JD, it looks like we were reading Thinking In Bets at the same time! I, too, recently finished, and found it to be a good read (even with my background in mathematics). Thank you for the summary — it’s a great reminder of what I’ve just read. I was wondering if you’d read Principles by Ray Dalio? That would be an incredible addition to your library. Highly, highly recommended. Annie’s book was added to my reading a month or so ago. I listened to her on a podcast (Jordan Harbinger’s, I think) and found it fascinating. There’s a classic business book “Good to Great” that covers quality decision making. In short, if you follow the right decision making process you will get a good decision the majority of the time. You won’t always be right – but you’ll know that you got there through a rational process. You can make a decision based on any criteria that turns out to be correct – but how often can that happen?